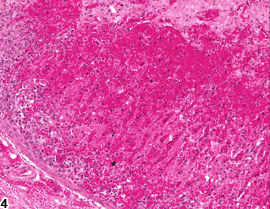 Adrenal gland - Hemorrhage in a female F344/N rat from a chronic study. Extensive, diffuse hemorrhage (Hem) is present in the cortex and medulla. 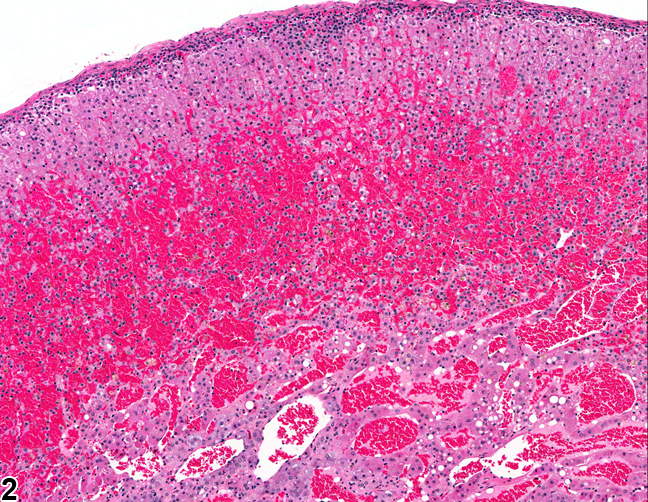 Adrenal gland - Hemorrhage in a female F344/N rat from a chronic study (higher magnification of Figure 1). Extensive, diffuse hemorrhage is present in the cortex. 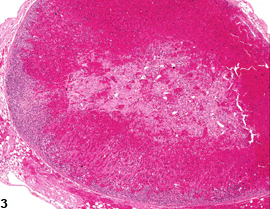 Adrenal gland, Cortex - Hemorrhage in a male B6C3F1/N mouse from a chronic study. Extensive, diffuse hemorrhage replaces much normal cortex. 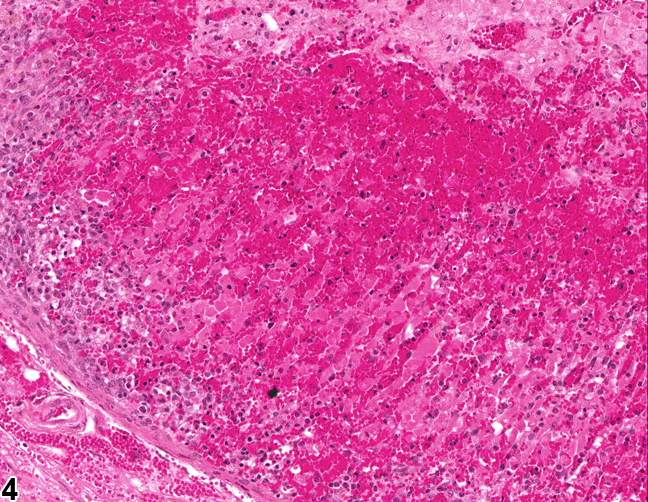 Adrenal gland, Cortex - Hemorrhage in a male B6C3F1/N mouse from a chronic study (higher magnification of Figure 3). Extensive, diffuse cortical hemorrhage almost obliterates the normal cortical architecture. 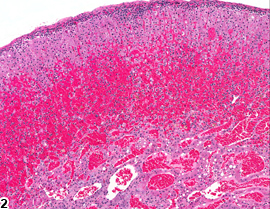 Adrenal gland hemorrhage ( Figure 1 , Figure 2 , Figure 3 , and Figure 4 ) is characterized by the presence of variable amounts of extravasated blood cells in the cortex and/or medulla. Hemorrhage can be focal or diffuse and range in severity from a small focal area to extensive involvement that can distort or even obliterate normal architecture ( Figure 1 , Figure 2 , Figure 3 , and Figure 4 ). Adrenal hemorrhage can be secondary to many spontaneous or treatment-related pathologic processes such as primary vascular disease, systemic coagulopathy, infarction, and septicemia. Many chemicals, as well as very high doses of exogenous adrenocorticotropic hormone (ACTH), are known to cause adrenal hemorrhage (primarily in the cortex), often in association with necrosis. Adrenal hemorrhage should be diagnosed and assigned a severity grade, site modifier (i.e., cortex, medulla), and distribution modifier (i.e., focal, diffuse). If it is present in both the cortex and medulla, the site modifier may be omitted and the location described in the pathology narrative. 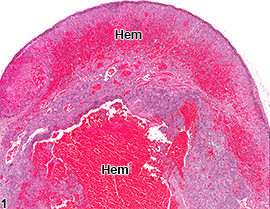 Hemorrhage secondary to other lesions (e.g., cystic degeneration, inflammation, or necrosis) should not be diagnosed separately, unless warranted by severity, but may be described in the pathology narrative. Braun AG. 1990. Survival, Age-Associated Disease and Neoplasia of the B6C3F1 Mouse: Lifespan Phase. MRI-NTP 52-89-145. TSI Mason Research Institute, Worcester, MA. Burkhardt WA, Guscetti F, Boretti FS, Todesco AI, Aldajarov N, Lutz TA, Reusch CE, Sieber-Ruckstuhl NS. 2011. 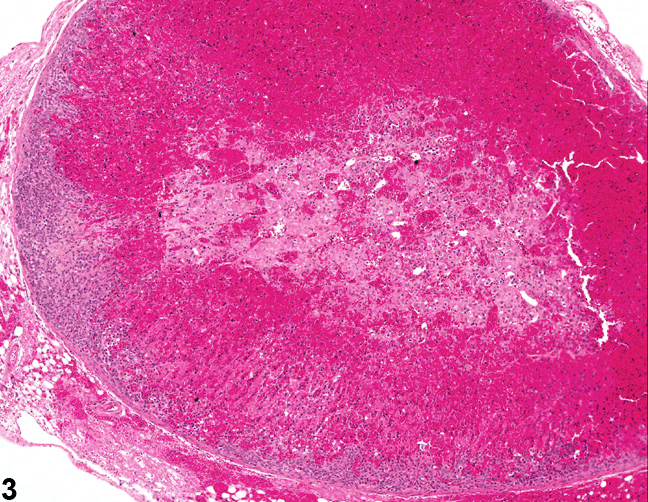 Adrenocorticotropic hormone, but not trilostane, causes severe adrenal hemorrhage, vacuolization, and apoptosis in rats. Dom Anim Endocrinol 40:155-164. Szabo S, Lippe IT. 1989. Adrenal gland: Chemically induced structural and functional changes in the adrenal cortex. Toxicol Pathol 17:317-329.